One mother said her quick thinking and nearby pistol helped protect herself and her kids during a home invasion. The police report says it all began around 7 p.m. on Super Bowl Sunday. A woman returned to her home in the 500 block of South Roosevelt Street and "Discovered a pair of shoes inside that were not there before." Police say as the woman walked outside to call the police, "Chambers approached her...and advised [her] not to call the police." As officers were responding Chambers took off running barefoot. He hopped a nearby wall, according to witnesses and ended up in The Standard Apartment Homes. He rushed into one woman's door. 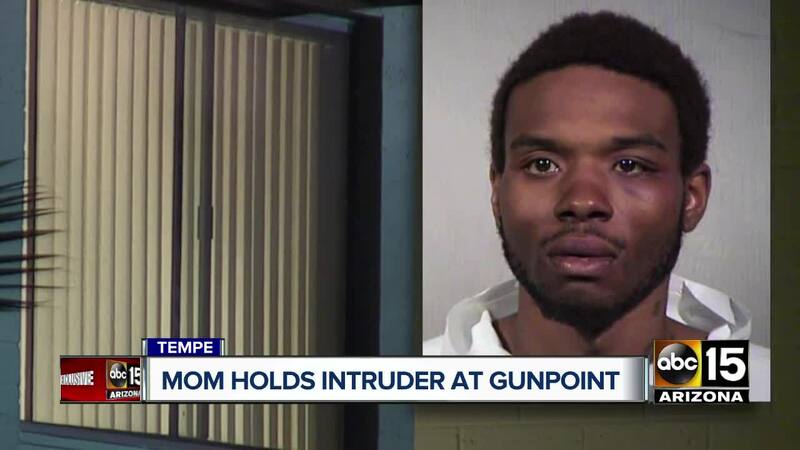 The mother told ABC15 her boyfriend had just left the home, and she was at the door locking it when Chambers burst in. "A guy walks in and is telling me to be quiet, be quiet. He says pretend I’m your boyfriend," said the mother, who asked not to be identified. The mother had different ideas. "I asked him to wait in the living room because my first instinct was to go grab my gun because I just need to protect everyone else. I hid it behind my pants," she recalled. The mother said her dad had taught her to use a firearm, but before she pulled the weapon, she tried to de-escalate the situation. "I’m trying to calm him down, see if I can get him help," she said. Chambers asked for a knife; however, and said he was being chased. "I refused to give him a knife because I’m like that could just lead to a totally terrible situation," she said. "Eventually I got my phone and...I dial the police up. He snatches the phone out of my hand, and that’s when I decide, I can’t do this, and I pull my gun out. I have it aimed at him, and I make sure he standing towards the door, yelling at him, 'You need to get out!'" The mother was able to get her phone back and call Tempe police, who were already in the complex looking for Chambers. The 27-year-old suspect eventually walked out of the apartment at gunpoint, where police were waiting. According to the Tempe police report, "Chambers was given several commands by police at the top of the stairs." Chambers reportedly "continuously disobeyed them" so police released their K-9, Chance. The dog quickly bit Chambers in the left forearm and "held on to Chambers' arm with his bite as Chambers began to punch the K-9 on the head several times." Several officers then tried to arrest Chambers, but he fought with them, "swinging his fists and his legs." One officer had a bloody and cut nose, and another had scratches and bruises on their leg. Chambers also broke a $100 radio. "He was really fighting; I heard him yelling and cussing out the officers. Practically begging them to shoot him," said the mother. Chambers was eventually arrested and taken to the hospital for his bite injuries before being booked into jail.